Finally Derrek and Resonance Sound are back and have teamed up on a super fresh collection of Future Bass Massive presets and MIDIs. Tags: Deep House, EDM, Future Bass, Hip Hop, MIDI, NI Massive Presets, Trap. Finally Derrek and Resonance Sound are back and have teamed up on a super fresh collection of Future Bass presets. Get everything you need – from synth layers to unique plucks – to create your fresh track in this dominating genre. This pack is inspired by the best and most sucessful producers like Flume, Jack-Ü, Pusher, Odesza, XXYYXX and many more. The included sounds reach from dolphine style and old gameboy influenced presets to soft saw pads similar to Flume’s music. As always, each sound has all 8 macros assigned to let you change the presets into completely new ones and give you instant ideas for a new song. 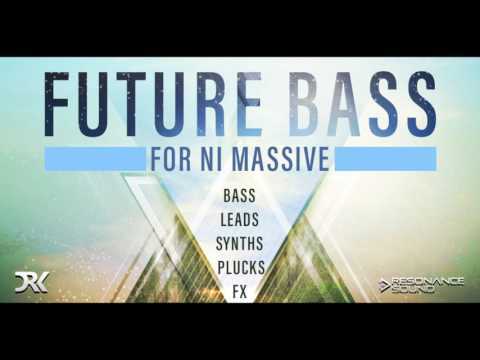 The basic modules of Future Bass exist of fast melodies and varying sounds. Often you get a Jazzy feeling when listening to those happy and ambient vibes. Therefore we offer you 50 MIDI files to boost your creativity! Simply drag and drop the MIDI into your DAW, load a suitable preset and create a new banger! Listen to the demo to get a feeling which different styles you can use these awesome sounds for.